I'd been having bad luck finding the good "Sainted Lady of Arepas" this year and probably had not seen her for at least a full year. So when word got out that she was serving up arepas on Governors Island on a sunny Saturday, I hopped on the first ferry and made a beeline for her cart. Her works of art were a Dollar more than usual, but still worth the trip and price. Normally they are $3, both in the queso and choclo varieties. I've always been a bigger fan of the queso (below), which is filled with the goo and topped with queso blanco. She crisps it to perfection, browns it a bit, and serves it super hot and melty. It's a touch sweet, and no one does it better. I can't explain why the carts a block left or right just aren't anywhere near her, it just is. Arepa de queso, the star of the show. 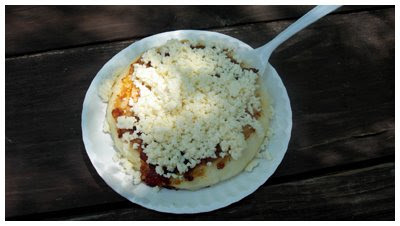 The other version is the arepa de choclo (below), worth trying but if you have room for one is probably the lesser of the two. 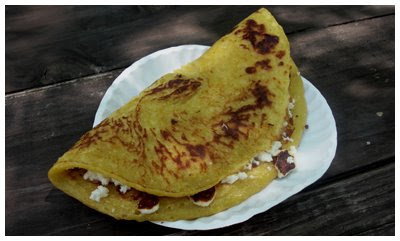 The arepa itself is thinner and folded over the queso, and tastes strongly of the corn it is named for. Beware of bad weather. It keeps her away. I feel like even a chance of rain keeps her home, which I don't blame her. Just know it is safer to stay home and not try to find her in Jackson Heights unless you can see the stars in the sky, but always check her Myspace page regardless to see her plans.